In a week where we have discovered that all that is needed today to become officially the next big thing is years of stage-schooling, a ton of promo cash, the weight of the whole record industry and an expensive video, let us be thankful that there are still bands plugging away in their garages to make new music. 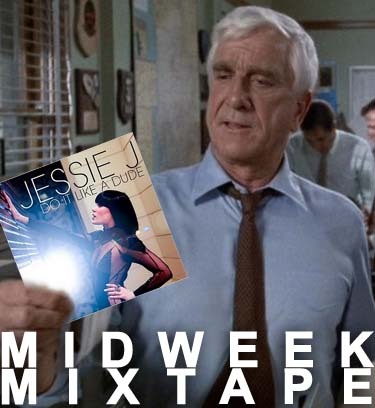 Quick, divert your attention to the Midweek Mixtape before we’re all forced to get down with the kids to the sound of Jessie J. FIRST! Mount Fabric sound like they ought to be an 80’s fuzzy-felt animated kids’ TV show, but in Coping With Belief we quickly discover that they are actually an agonisingly lovely epic-rock band, with stratospherically unusual vocals and songs that pan out before you; widescreen, ambitious, dallying with sounds not heard for a long time. Unexpected and exciting. SECOND! T-Model Ford pushes the concept of ‘new’ beyond its frosty outer limits: the man is 90 years old, for god’s sake. Still, he’s new to me, and probably to anyone within the last three generations, so why use age as an excuse to miss out on his bellowed, rusty old-time blue? Same Old Train is the closest you’re going to get to being transported back 70 years in time this week, at least. Endearingly excellent rough ‘n’ ready grunting. THIRD! You And Others Around You left me in contorted mental discomfort as I struggled in vain to figure out who they sounded like. Agonised, I listened to their song repeatedly, and it’s a sharp, clever slice of jangly, superior, quirk-pop. Then I remembered, just as I was about to give up, that they sound a bit like The Wedding Present. Which is a good thing. FOURTH! Crystal Bright and The Silver Hands – and speaking of agony, CB&TSH are the most blatant heart-string tuggers of the week. Little Match Girl is surely the most fragile and overblown; bitter and sweet song that can be produced without the recording studio being ruined by a tsunami of tears. Phew. FIFTH! The Holidays have made, in Broken Bones, a song which is so airy that it practically bobs past suspended by a helium balloon. It doesn’t though, as that would be ludicrous. An alluring song that makes time slow woozily, it’s accompanied by a pretty smashing video, if you like that kind of thing. Posted on January 12, 2011 by Joe Sparrow. This entry was posted in Headline, Today's New Band and tagged Midweek Mixtape. Bookmark the permalink.